Dogs chew. It’s a fact of life. They use their mouths to explore things around them inasmuch as we use our hands to examine our environment. Rather than trying to stop them, which will only result in frustration, direct them to something they can chew on to their heart’s content. He is lonely. If left alone for long periods of time in an unstimulating environment, your pet will chew out of boredom. The first thing you can do to remedy the situation is to make sure he gets his daily exercise. Walk your dog every day. If you can’t take your dog out, use the stairs to tire him out. Next, since dogs have an instinct to hide out in dens, confine your dog in a kennel crate together with a few chewies, such as Nylabones and rawhide knots. He is suffering from separation anxiety. Dogs are pack animals and many don’t do well in isolation. When you leave your dog, make sure he is in a secure and comfortable place. Again, a Kennel crate is your best option. Next, before you leave him with his chew toy, rub the toy between your palms. Your pet will focus more on the toy that has your scent than on something else. Although you should expect a certain amount of chewing from a new pet, the smart approach is to direct them to things we want them to chew and to correct inappropriate chewing before it gets out of hand. Give your pet acceptable chew toys. Old shoes, towels, scrap wood, or phonebooks are not acceptable chew toys. Dogs cannot differentiate between old shoes and new shoes, or scrap wood from kitchen cabinetry. Don’t confuse your dog by giving him anything that may be mistaken for a forbidden object. Discourage inappropriate chewing. If you do find your dog chewing on something, stay calm, and lightly touch your pup on the neck or hindquarters to redirect his attention. Don’t try to pull the object away from him if he doesn’t drop it. Direct his attention to an appropriate chew object and give praise when he chews on said object. 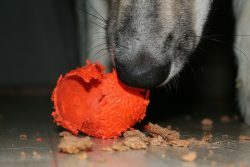 Once your dog has dropped the object, it is important for you to claim it as your own. Use your body language to make it clear that there’s a connection between you and the object. You can pick it up and hold it close to your body. Gradually, your dog will learn what objects are his and which are not. Make forbidden items unpleasant to your dog. Furniture and other items can be coated with a taste deterrent (such as Bitter Apple®) to make them unappealing. Puppy-proof your home. Look around your environment for possible dangers to your puppy. Place household cleaners and chemicals out of reach along with potentially toxic plants. Electrical cords should be covered or made inaccessible to prevent chewing on them resulting in electrocution. 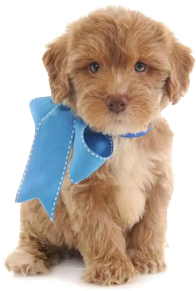 Remove objects of curiosity that might appeal to your puppy such as shoes and socks, children’s toys and the like. Block access to rooms that have not been puppy proofed and consider crate training your dog for the times when he cannot be supervised. What to do when your dog doesn’t come when called?